As 1958 dawned, Jerry Lee Lewis was riding high. He’d recently had two huge hits with “Whole Lotta Shakin’ Goin’ On” and “Great Balls Of Fire.” He exuded an untamed wildness onstage that few before him had dared unleash. Lewis, or “The Killer”, as he would come to be known, was a deeply religious former Southwest Bible Institute student who was now playing the “devil’s music” and would come to embody the true unbridled and uninhibited spirit of rock and roll. In May of 1958, the British welcomed Lewis at London’s Heathrow airport with open arms. Everything was going swimmingly until a reporter from the Daily Mail named Paul Tanfield asked a lovely young lady in Jerry’s group who she was. “I’m Myra, Jerry’s wife,” replied Myra Gail Lewis. But inevitably all the details of his marital history came to light. It was discovered that not only was Myra Lewis a mere 13 years old, she was also Jerry’s first cousin once removed. It also turned out that Lewis was committing bigamy, as his divorce from his second wife wouldn’t be final for another five months. Jerry tried to sooth everyone by saying his second marriage was null and void anyway, as he had married his second wife before he’d divorced his first one. For some reason, this didn’t seem to help his case any with the public. The press hounded Jerry and Myra mercilessly, and the public outrage was palpable. Lewis gamely tried to continue with the tour but was forced to cancel after the first three shows drew poor tickets sales, and those that did show up did so to boo and catcall. Within a week, Lewis and Myra were back in the United States. Jerry very quickly went from demanding $10,000 a show to playing $100 club gigs, with most of his industry “friends” turning their backs on him. This was a difficult thing for Lewis to wrap his brain around, because in the rural Deep South of his upbringing, marrying cousins was not uncommon (as it wasn’t through most of human history, and even today is still quite common in many parts of the world, see: The Truth About Cousins and Marriage). As for her age, contrary to popular belief, marrying 13 year olds has always been uncommon, so it’s not surprising people found this more than a little creepy and off-putting, because, well, it’s a little creepy and off-putting. That said, exceptions happened, particularly if the man was well-off, seemed like he would treat the girl well, and wasn’t too old; and if the parents and the girl were amenable to the marriage, little controversy would normally have been stirred up over the matter in the South at that time. (This was an era when, very unfortunately, a woman’s financial prospects in life were still often intimately tied to the man she married, so securing a good match was much more pressing. “Keeping it in the family,” so to speak, could also be advantageous in providing a potentially more secure marriage, or at least one where the parents knew the prospective husband well before the marriage. Divorced women of this era often had fewer prospects for securing their financial future, which has been suggested to be the reason diamond engagement rings became so popular around the same time women stopped being able to sue for as many damages in cases of broken engagements or divorces.) But the wider world was not so accepting of such a union and the marriage dogged Lewis for the the rest of his life. Musician Kris Kristofferson remembers, “I was in England when they ran him out of the country, and it really seemed unfair to me, because he had no idea he was doing anything wrong.” This is perhaps also a little ironic from a country whose monarchs at the time were second cousins once removed, as well as third cousins, and first began courting one another when Prince Philip was 18 and future queen Elizabeth II was 13 (when she says she fell in love with him). In the end, Jerry Lewis and Myra stayed married for 13 years, the second longest of any of his astounding seven marriages. You may want to clarify in your headline that this is about Jerry LEE Lewis. Most people who know both names will associate just “Jerry Lewis” with the comedian, not the rock singer. 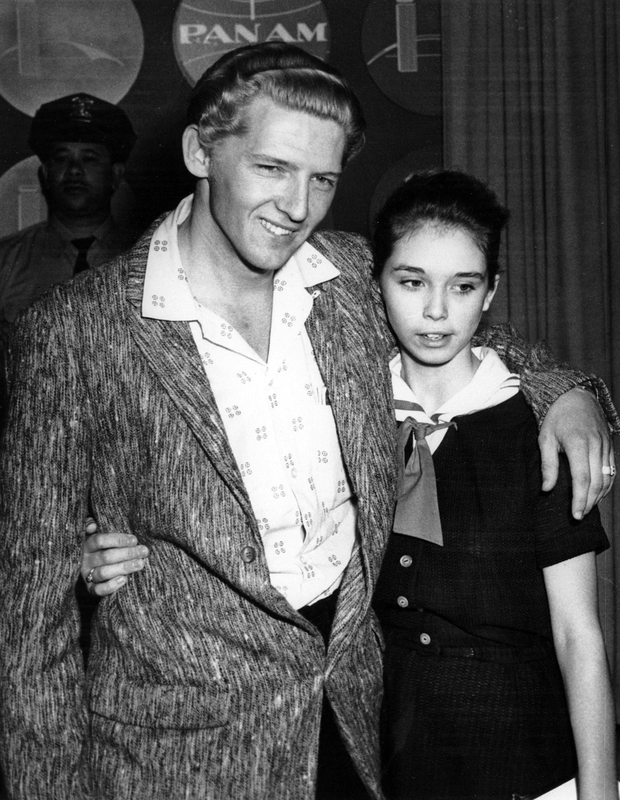 Funny, people make a lot of noise about Jerry Lee Lewis marrying his 13 year old cousin, but no one ever talks about the preacher who thought it was alright to do. Since Jeb Tolbert’s comment (of May 22, 2015) was overlooked or ignored, I will re-state it, because I had a similar reaction when I came to this page. Nonsense! Kristofferson’s ludicrous comment should not have been quoted. In the 1950s (and I hope today), every sane person in the U.S. knew (knows) perfectly well that it was (is) considered “wrong” for a man in his twenties to attempt to marry and to sleep with a thirteen-year-old girl. It is not the least bit “ironic.” First, marriages of that distant a degree (second/third cousins) have never been controversial. Second, the people of England knew that their queen had remained a virgin until the night of her marriage at the age of 21 and 1/2. Poor little Myra was fooled by her wild cousin into giving up her virginity at the age of 13, if not earlier. It is no wonder that the English people (and later the American people) treated Lewis as they did.